911uk.com - Porsche Forum : View topic - New Ohlins, what else? 911uk.com Forum Index > 996 (1997 - 2005) > New Ohlins, what else? 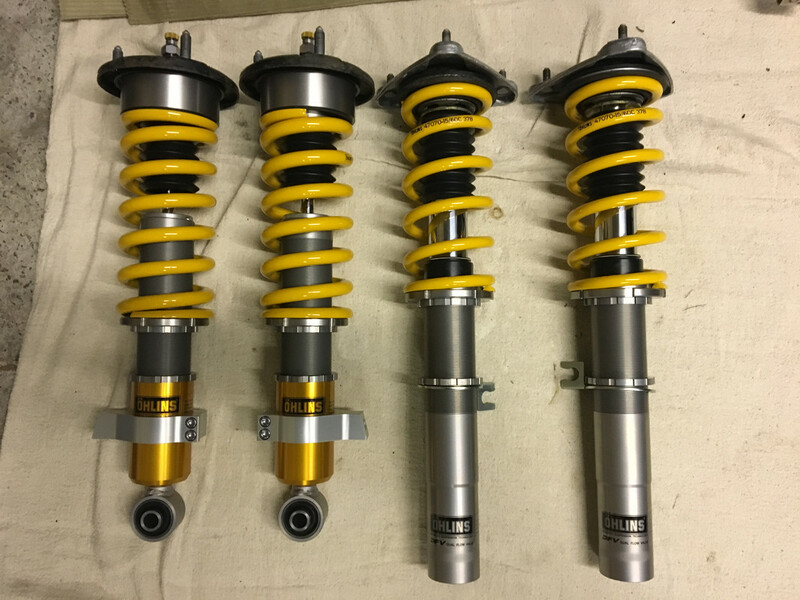 Posted: Tue Jan 15, 2019 3:36 pm Post subject: New Ohlins, what else? As the title suggests - after a visit to the Autosport show last weekend I came away with a set of Ohlins Road and Track DFV for my C2 3.6 - well on order anyway! Speaking to the approved supplier (BG Motorsports) they come with some recommended settings and heights, and it will be going off for correct set-up anyway. I plan on fitting myself as the car is laid up through winter until at least April. Question is, whilst I'm in there, what else should be replaced? previous owner put a single new top mount on about 6k ago. What are other people's experiences with a suspension renew at around 70k and what else required replacement? Should I go with 4x new adjustable drop links as well so I can set the ARB pre-load with the car sitting a bit lower? I know a man who knows all about those. (see CobraRS thread). When we were at CG they said Craig probably shouldn't have bothered ditching his new standard ones for adjustable items. They mainly aid in clearance if things are getting close. Unless you're altering the mounting point (different holes in the bar) or fitting stiffer bars, then they don't aid or affect the set up. You've pretty much got everything else covered plus the top mounts. There are also bearings under the front top mounts but these can usually be stripped cleaned and repacked with grease. I covered this on my thread. Rear top mounts are usually reusable as they don't rotate or anything like the fronts have to. Apart from that just be ready to spend way over the odds on bolts, clips and fixings from the main dealer. You will need adjustable toe arms if you want to go lower than X74 spec (which is still higher than GT3) to get the camber/toe setting correct at the rear of the car otherwise you’ll run out of adjustment. I’m just going through this issue with my car and lowering springs. How low are you going? 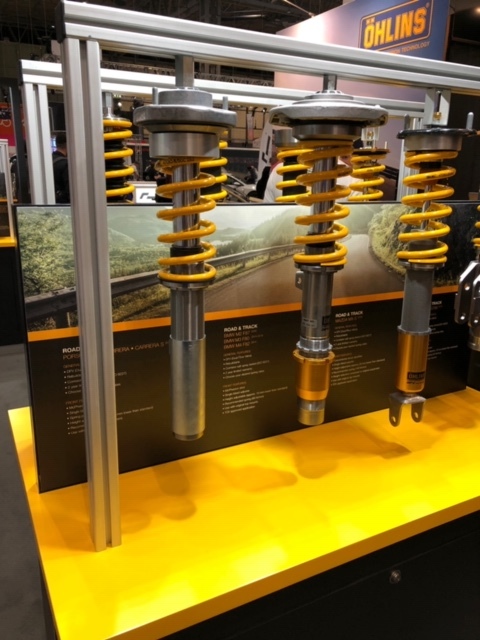 Speaking to the guys on the Ohlins stand I was planning on 15-20mm absolute max. Congrats to a great choice! I've been running these since mid-summer '18. Going from M030 chases I'm very pleased about how the car feels now. Thank for the replies, can’t wait to get them on! I put those on last year, amazing piece of kit. Those and a Centre Gravity setup has totally changed the car..... Best purchase for the car to date.... I'm sure you'll love them !!! The shocks are the last thing on my suspension refresh (all other things changed) so should transform the car now. OCD question...do you run coil over covers or leave as is? Want to keep them clean!!! I don't use coilover covers, no.... but then my car is just for sunny days and doesn't get subject to all the elements.... If i was to use it more in the salt and rain, then i'd probably look into using some covers to protect the springs, but as long as you wash the struts and springs every now and then when you wash the car they should stay in pretty mint condition. Stone chips may be an issue over time, but you can remove the springs one winter and have them powder coated again. I had KW V3's previous to the Ohlins, they were already on when i bought the car and they were in some state, so i had those springs powder coated. The Ohlins look a lot better quality though !!! Never used covers either, so can't really say if they are any good not.... Someone else on here may have used them and will be able to give you their opinion on them. Morning Mark. Whether you need adjustable ARB droplinks on a C2/4 is as Chris says, questionable. However if you’re wanting to do an accurate (Chris Franklin type accurate) ride height and corner weight adjustment on a 996GT3/2, you may well need them as the ARB’s can have some tension/preload in them when the car is on level ground at static ride height. Adjustable ARB droplinks allow you to effectively remove that preload so it doesn’t influence the corner weights. However, you won’t need 4 adjustable drop links ... One front and one rear is all you’ll need, as you don’t/can’t adjust each corner of the two bars, you merely need adjustment across the bar. And for those thinking of buying a pair, save yourself a shed load of cash and don’t buy off the shelf items from the likes of Tarret etc. Make your own. The parts can be bought from McGill Motorsport. 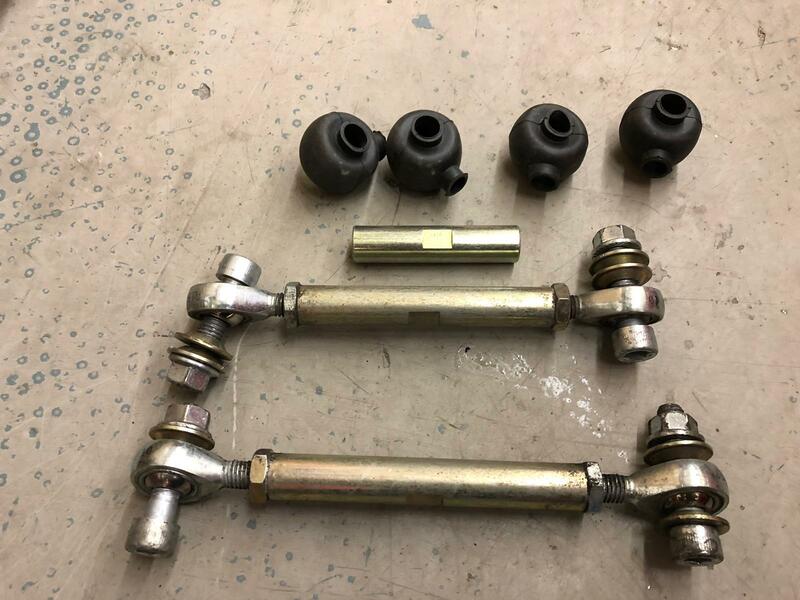 I’d check the steering rack external metal pipes (chap in Borsall Common makes them for about £40) and the front transverse brake pipe (£54 from porsche IIRC). Both need the front subframe dropping so instant geo re-check. I did mine and a bit of a pig as had to prop the fuel tank up whilst you drop the subframe. I had a mate help me who is a mechanic just for dropping the subframe as its F heavy with the suspension / rack attached! Brake pipe a bit fiddly to insert as the original goes under the transverse tank strap and new one goes over it. Also brake flexi’s and short metal pipe to caliper worth checking.